The San Francisco Chronicle, whose shelves are not exactly lined with Pulitzers, was a tad bit off. The final toll was 63. For years San Francisco’s best kept secret was its summer weather comes in September and October. The tourists have since caught on. The Wal-Mart whales still show up in July in tank tops and cut offs. In the 56 degree fog they’re a sight that never ceases to amuse. But October is no longer our own private Idaho. 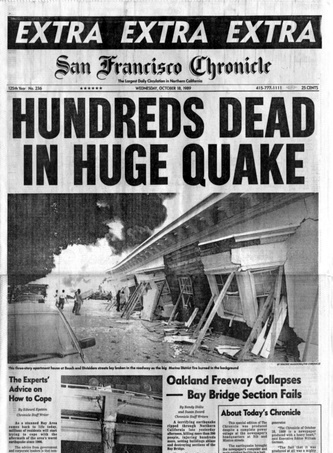 These warm Fall days always remind me of the Loma Prieta quake. With the World Series in town again those memories are reinforced. In 1989 I left work at 5:00 hoping to get home in time for the opening game anthem, probably the most inspiring of all the anthem genres. I walked out, turned left on California Street and saw this cloud coming from the Fireman’s Fund building. I thought it was on fire so I crossed the street. In the middle of California I heard this horrid rumble beneath me. It was mortar dust not smoke coming from the brick building, we were having an earthquake. I ran for cover under the metal canopy of a Wells Fargo ATM. I stood there with a dozen strangers waiting for it to end, focusing on the street light in front of me. It swayed endlessly in a 20 degree arc like an upside down pendulum. Then it stopped. We all stood there for a few seconds and I took off up the hill. When I got to the top at Stockton and Pine I turned back to survey the scene. For all the chaos that was going on it seemed so still. The traffic lights were out but cars were observing the etiquette of four-way stops. The Financial District was being unusually un-type A, playing nice and cooperating. I walked one more block and ran into a woman with a platinum helmet of hair. 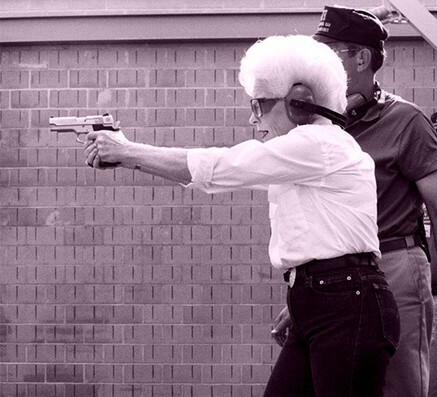 It was Ann Richards, the Texas State Treasurer. At the time she was best known for her keynote address at The Democratic Convention; a year later she would be elected Governor. It was just she and I alone on the corner of Pine and Powell. We looked at each other then moved on without saying a word. When I got home my kitchen cabinet doors had all swung open and anything that had been on a south wall had fallen. Except for no power, the rest of the apartment was just as I left it. Loma Prieta Ann. The quake rendered us both speechless. I improvised a meal with my friends Jane and Walter from down the street. My gas stove seemed to be working so we risked another ham and eggs fire and grilled hot dogs. We didn’t think we could use the water. We drank our stashes of beer which we would have hated to lose to lack of refrigeration. They were supplemented with any other spirits we could find. The next morning we walked around the ghost town of Union Square. There were no cell phones at the time and phone service was spotty so you had to kind of piece together what was going on with your friends. After 24 hours, unless you had heard someone was in trouble you assumed everyone was okay. There wasn’t much to do but wait and wonder. Two days later we did hear of a friend whose house was on a slight 45 degree angle and had been condemned. Finally, something useful to do. David and I took his pick up and helped him move. That night at 3 am I was awakened by my TV blaring and the lights coming on. It was over. Until the next time.